Leaders from around the globe have been anticipating the voluntary end of Mubarak’s 30-year presidency. Protesters shouted “leave, leave,” and chanted disapproval at the prospect that their 17-day standoff with the government was not coming to a close. Mubarak not only seemed divorced from the demands of his people -- augmented by increasing pressure from Washington and other Western powers -- but dazed and dissociative. “Hours before the speech, an army commander appeared in Tahrir Square and told us that all our demands would be met,” one protester said, certain that the announcement of Mubarak’s address implied that he would be stepping down as president. But Mubarak’s refusal to resign brought a chill to the jubilant mood that had settled over the crowd. Several ranking Egyptian officials seemed equally bewildered. 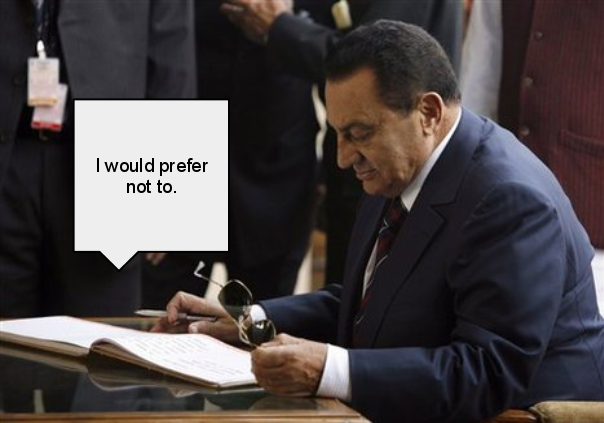 Senior party members reluctantly admit that Mubarak’s strange behavior and predilection for the phrase “I’d prefer not to” have been issues in the past. Unfortunately, the problem has grown over the last two years. One official, who asked to be called Emad for reasons of anonymity, begrudgingly confessed that no one in Egypt really knows anything about Hosni Mubarak, apart from the fact that he prefers not to do a great many things, such as upholding the wishes of his people or implementing a democracy. Emad detailed his experience with Mubarak’s dubious history in a prepared statement. He stayed there day after day, refusing to leave, refusing to do other work, refusing to acknowledge any of our requests. Then I discovered that Mubarak was living in the office. I found his clothes and a toilet kit in one of the desk drawers. He’d also amassed a large collection of condoms and hummus containers and the silly Sphinx-shaped cigarette lighters that American tourists buy. So I demanded that he go. But of course, he refused. On a hunch, I contacted an officer in the Egyptian Air Force. He described to me an eerily familiar scenario. They let Mubarak pilot fighter planes, even though they were reasonably certain he had no previous flight experience. Apparently, he climbed into the cockpit of a jet one afternoon and could not be persuaded to come out. I eventually relocated my office staff to a different building. Mubarak stayed. I thought I was rid of the pest. It was not to be. A week later, the new occupants, who were engaged with the president’s cabinet, called and complained that I should collect my missing employee. After I described the situation, they admitted to similar confrontations with Mubarak; but it was no longer my concern. Somehow, years later in 1975, Mubarak was appointed vice president -- I suppose because he refused to do anything they asked of him or to leave. After President Anwar El Sadat’s murder in 1981, Mubarak became president. There’s nothing to be done about it. 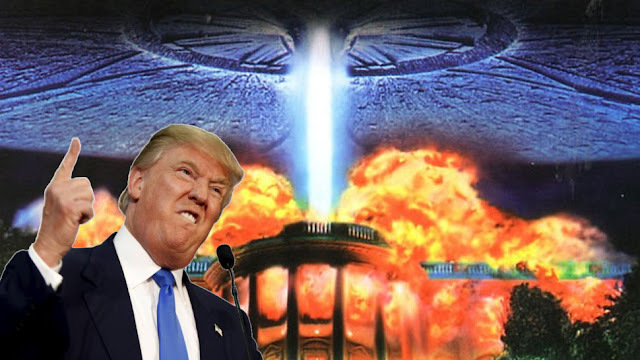 The man is steadfast and unflappable. We just have to wait him out until he prefers to be on his way.